On May 14, the 16th Boya Public Law Forum was successfully held in meeting room 307 of KoGuan Building. 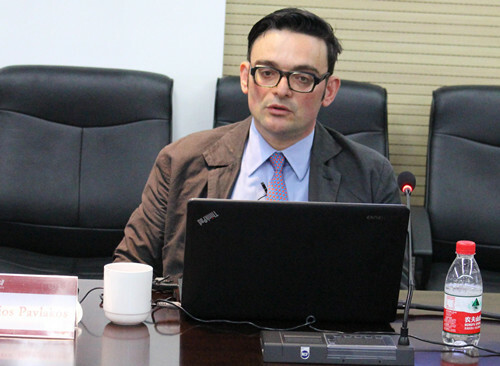 Professor Georigios Pavlakos, from University of Antwerp law school in Belglum, made a speech on the topic of original legal relationship——the standardization of the globalized world. 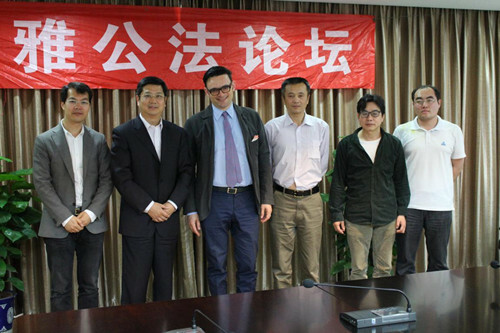 The guests speakers were Chen Duanhong, professor of Peking University Law School, and Gan Chaoying, professor of Peking University Law Schoo, Chenyifeng and Liugang, teachers of Peking University. Wang Lei hosted the forum and more than 20 teachers and students form the universities and science institutions in Beijing attended the forum. In the beginning, the host introduced the chief guests of speaker and other guests to all the participants, especially the studying experience and academic contribution of the chief guest. Professor Georgios Pavlakos is not only the visiting professor in law theory and globalization of University of Antwerp law school in Belglum and professor of University of Glasgow in Britain, but also the director research center of law and public affairs in State and Law Institute. Professor Georgios Pavlakos is a famous scholar of legal theory, the promoter and organizer of research for legal globalization within the scope of the European Union, and had extensive academic influence and ability among countries in European Union like Belglum, Netherlands, UK, Germany,Italy, Greece and the Czech Republic. During the period of statement, Professor Georgios Pavlakos said that in recent years, with the intensification of globalization, the established understanding of international law has changed. This changes was not only challenged bin terms of the scope and obligation subject of the international law, but also the hierarchical relationships between the enacted law norms are equally controversial. Now it’s time for the reflections on the core functions of legal relation. He hoped to provide a conceptual framework for understanding beyond the state and the whole domestic obligation of law and order. During the conversation period, all the assembled guest in this forum have made comments on the host’s speech, and the participants also made in-depth communication with guests.